There is an app called Agendas that allows you to create agendas for a meeting (and a ton more)… but, it doesn’t do a presentation! It’s an interesting concept to get your head around, it took us a while. Anytime someone talks about software for a meeting, the first two things is either note taking or presentation software like showing a Power Point. A meeting agenda is neither of these. When you set up an agenda for a meeting, you are creating documentation for discussion points. It is the subject items you are planning on covering and can carry a bit of detail to help people understand why they are attending. Once you understand the difference, then you will see the true power of having Agenda on your iPad. The application can be used just on your device, or it can push out to other iPads on the network. If you are sharing your ‘documentation’ with other iPads, they will need to have the software installed also. Some offices have all of their iPads on a single account so you just load Agendas on all units but if each iPad is set up on it’s own then there is a need to buy a copy of Agendas per device if they are to share or view only. 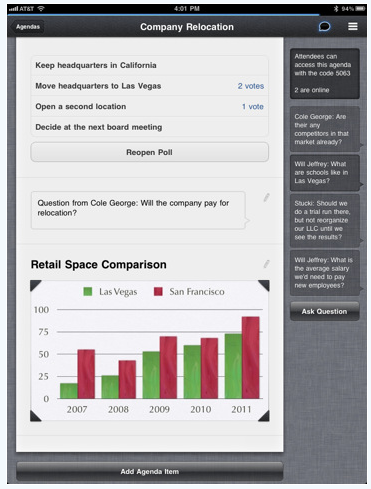 An agenda with text and images is laid out on a single device using the Agendas app. When completed, it is ‘shared’ which means other iPads with the software, on the same network, can see an icon for the agenda. To actually access, they will need a four digit code that you distribute, thus only the meeting invitees are in on the document. Agendas allows for a meeting length time limit to be set which runs down during the meeting to keep everyone on task. The app can be used for your own reference, sharing with other iPads isn’t required. People can ask questions which can then be voted on by other attendees to move it up the list of importance. The agenda document others are viewing can be added to during the meeting, changing on other atendees iPads view too. Notes can be taken during the meeting by anyone in the meeting which are saved to their copy on their iPad for later reference. (The developer mentions export to PDF is in the plan). Being version one, there is a couple features that need more power added. There are no bullets or much of any font adjustments available. And, Agendas has all text being entered into a ‘little’ box, it would be nice to see that grow. Some might think they need additional pages to flip through in a meeting… remember, this is ‘agenda’ software not ‘presentation’ software. Lastly, a ‘view only’ version of Agendas or group pricing would be nice… fingers crossed on that one so we can go to meetings outside of our company and have more people show up with Agendas installed on their iPads so everyone can see and comment. The app isn’t that expensive but it will be most successful for everyone if it is an affordable standard everyone installs. Many of us are trying to figure out what we can use it for around the house… do we need to have an agenda for weekend chore planning?